When we first begin the hobby of metal detecting all of the new terminology and available technology can be a bit overwhelming. Trying to wade through ten thousand articles and forum comments to find answers can be tiring, especially when there are millions of opinions being shared. Talk about information overload! That’s a valid question, but it made me realize something. Much of what veteran detectorists believe is common knowledge, isn’t common knowledge, yet, to those who are new to the hobby. We all start at the beginning, and one of the best parts of the metal detecting community is that detectorists freely share information in an effort to help each other be more successful. 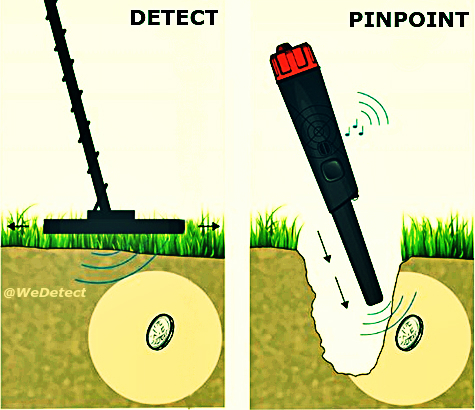 So, What is the difference between a metal detector and a pinpointer? In layman’s terms, a metal detector is a hand held electronic device consisting of a shaft, electronic control box and coil that detects the presence of metals under ground. When metal targets are detected the user is alerted via a tone and digital target ID number on screen. 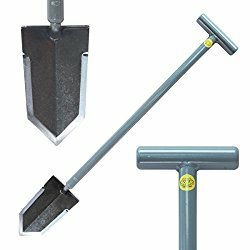 Simply put, a metal detecting pinpointer is a hand-held probe usually around 8 inches long that is used to locate targets in the hole once the detectorist has opened the plug. Metal items can be camouflaged in the dirt, so a pinpointer alerts the user by vibration, and tone indicators. Usually, the closer the probe is to metal, the faster the beep of the tone. There you have it, that’s basically the difference between a metal detector and pinpointer. Both have a place in your arsenal and both are essential items for metal detecting that you need no matter what your experience level is. Maximize your time by using the correct tools for the job so you can recover targets faster, dig cleaner plugs, and get more keepers per hour. This entry was posted in Metal Detecting and tagged metal detecting pinpointer, metal detecting probe, pin-pointer, the difference between a metal detector and pinpointer, what is a metal detector, what is a pin-pointer, what is a pinpointer, What is the difference between a metal detector and a pinpointer, what is the difference between a metal detector and pinpointer. Bookmark the permalink.